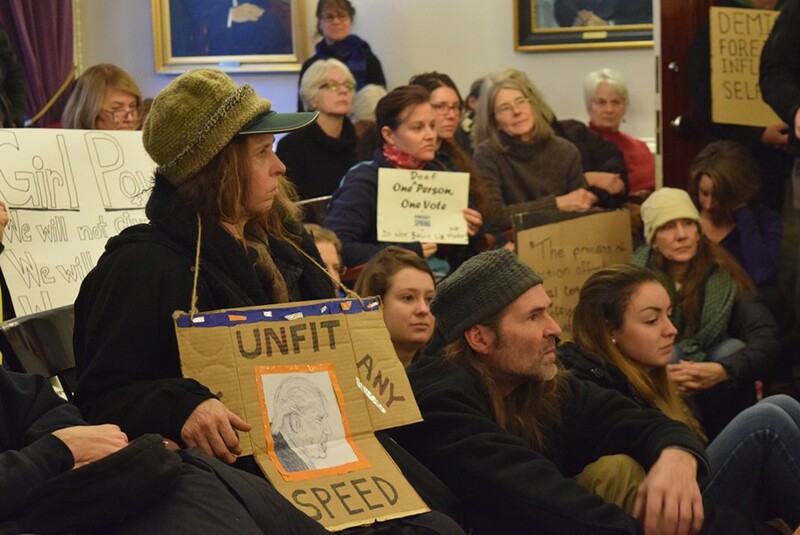 Vermont’s electors prepare to vote Monday while protesters look on. Normally, when the three Vermont members of the electoral college convene to formally cast the state’s votes for president and vice president, no one comes to watch. This year was different. Some 200 protesters jammed the Statehouse meeting room hoping to make this pro forma ritual anything but. Across the country, protesters hoped a revolt by electors in each state would keep president-elect Donald Trump from taking office. “One person, one vote,” they chanted, protesting the concept of the electoral college. “Dump Trump,” some of the signs read. As Tim Jerman, one of the three electors, waited for the official ceremony to begin, protester Bob Dana of Belvidere urged him on. “Do your duty,” Dana said. But just what was Jerman’s “duty?” Opinion varied. “There’s at least five iterations of what people want,” said Jerman, a state representative from Essex Junction who is also vice chair of the Vermont Democratic Party. Jerman and the state’s two other electors — Gov. Peter Shumlin and Martha Allen, president of the Vermont-NEA teachers’ union — saw it as their duty to cast votes for Democrat Hillary Clinton because she received the most votes in Vermont on Election Day. At a meeting that took just 12 minutes, they became the first electors in the country to report their result. Protesters watch Vermont's electors certify the state’s three electoral votes for Democrat Hillary Clinton. Allen agreed. “I understood when I became an elector I was expected to do that,” she said. But the electors got plenty of other advice. Some people wanted them to vote for Sen. Bernie Sanders (I-Vt.) because — well — he almost won the Democratic presidential nomination. Or for any Republican who’s “more qualified” than the actual president-elect. That’s what Dana wanted. “The right thing to do at this juncture is to acknowledge we lost the election,” the self-described liberal said. But he could not come to grips with the idea of a President Trump. “He’s not qualified,” Dana said, noting the president-elect’s lack of public service and his refusal to reveal his financial interests. Jerman and Allen agreed. Trump’s not qualified to be president, they said. “He doesn’t have the temperament,” Jerman said. 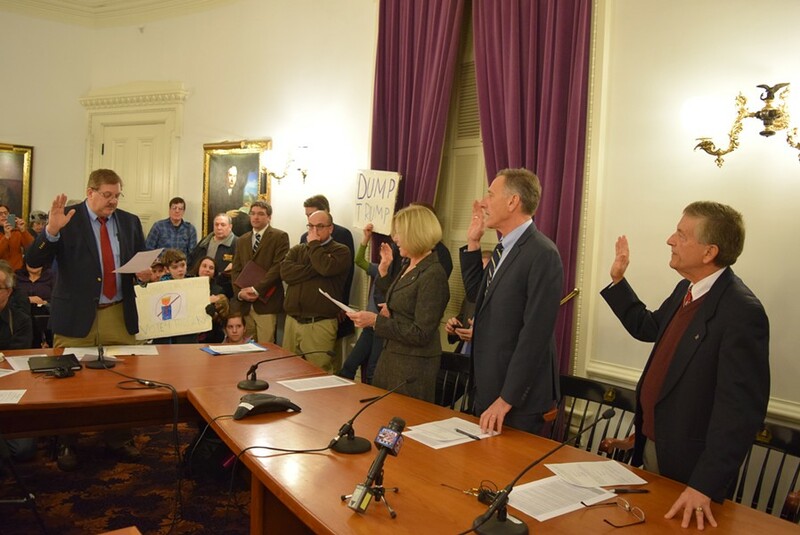 Vermont’s electors take the oath Monday in the Statehouse while protesters stand by. 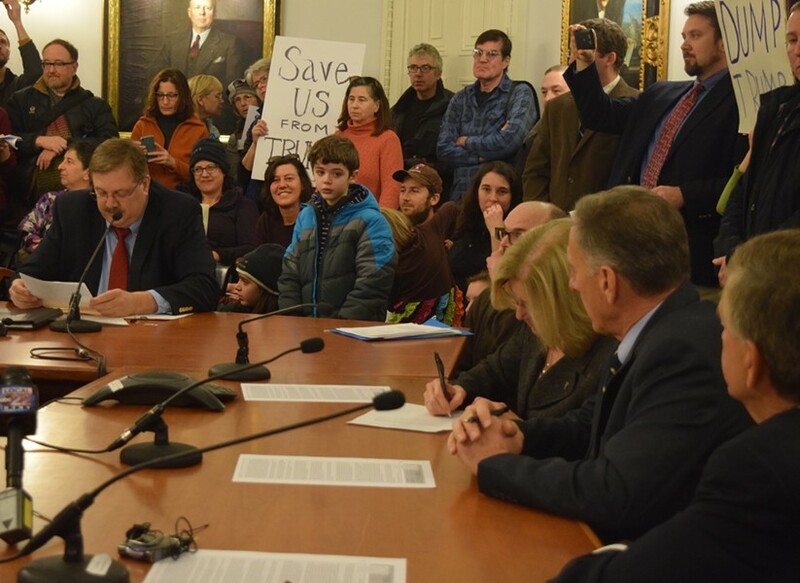 Shumlin, who leaves elected office next month after not seeking reelection, hedged. “Donald Trump is the president-elect,” he said. But he did say he considers Trump to be the most troubling presidential choice he’s ever seen. “No question, this is the first president-elect that has truly made me, and I suspect a lot of Vermonters, really uncomfortable about where our country’s going,” he said. The Vermont Democratic Party chose the electors and a new batch is selected every presidential election. This year’s trio agreed that the electoral college, the constitutionally created mechanism by which presidential candidates are elected, doesn’t work well. Though Trump won 306 electoral college votes in the November 8 election, it was Clinton who won the popular vote by nearly three million votes. “The person who gets the most votes should win,” Shumlin said.